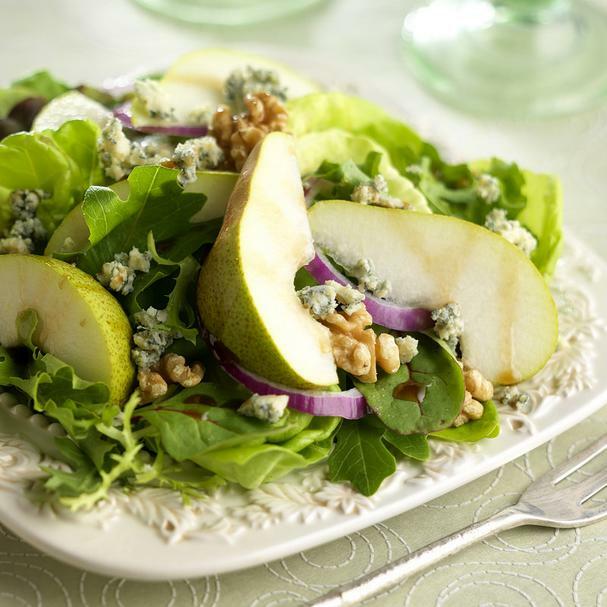 Pears and blue cheese make a perfect pairing, and when tossed with heart-healthy walnuts, thinly shaved red onions, salad greens and a simple balsamic dressing, you've got an easy and delicious salad! This salad would make a beautiful presentation when served on a platter for Easter or any holiday meal. Line a large platter with greens. Top with pears, sliced onions and sprinkle with walnuts and crumbled cheese. Combine vinegar and oil to taste. Drizzle dressing over salad. Serve with crusty bread, if desired.